I am presenting here my vision for a large pumped storage hydroelectric 2-square kilometres surface-area reservoir and 300+ metre tall dam which I have designed for the Coire Glas site, Scotland. I was inspired to conceive and to publish my vision by learning of the Scottish and Southern Energy (SSE) proposal to build a smaller hydroelectric pumped-storage scheme at Coire Glas which has been presented to the Scottish government for public consultation. I have not long been aware of the SSE plan for the Coire Glas scheme, not being a follower of such matters routinely, but I was prompted by an earlier tangentially-related news story (about energy storage technology for renewable energy generators such as wind farms) to write to Members of the Scottish Parliament on the merits and urgency of new pumped storage hydroelectric power for Scotland on 14th February and a reply from Ian Anderson, the parliamentary manager for Dave Thomson MSP received the next day, the 15th February informed me about the SSE plan and Ian added "initially scoped at 600MW but, to quote SSE, could be bigger!" I replied to Ian "So the schemes proposed by the SSE are welcome and ought to be green-lighted and fast-tracked, but I am really proposing that Scots start thinking long term about an order of magnitude and more greater investment in pumped storage hydroelectric capacity than those SSE plans." So I had in mind "bigger would be better" but it was not until the next day on the 16th February when a news story informed me that the SSE plans had been submitted to the Scottish government for public consultation that I thought "this needs consideration now". So starting late on the night of the 17th, early 18th February and all through the weekend, I got busy, outlining my alternative vision for a far bigger dam and reservoir at the same location. So this is my vision as inspired by the SSE plan. If my vision is flawed then the fault is mine alone. If my vision is brilliant, then the brilliance too is mine. The black contour line at 550 metres elevation shows the outline of the SSE proposed reservoir of about 1 square kilometre surface-area and the grey thick line shows the position of the proposed SSE dam which would stand 92 metres tall and would be the tallest dam in Scotland and indeed Britain to date though it seems our dams are several times smaller than the tallest dams elsewhere in the world these days. Part of the red contour line at 775 metres elevation, where the red line surrounds a blue shaded area, blue representing water, shows the outline of my larger reservoir of about 2 square kilometres surface-area and the thicker brown line shows the position of my proposed dam which would stand 317 metres tall which would be one of the tallest man-made dams in the world. The green ellipse of major diameter of 1.5 kilometres and minor diameter of 1 kilometre represents an excavated reservoir bed, as flat and as horizontal as practical, at an elevation of 463 metres. Since an excavated reservoir bed is not, that I can see, part of the SSE plan, at any size, I will provide some more information about my vision for that now. The basic idea of excavating a flat or flattish reservoir bed is to increase the volume of the water stored in the reservoir because more water means more energy can be stored. Depending on the geology and strength of the rock of Coire Glas the walls of the reservoir bed perimeter could be as steep as vertical from the reservoir bed up to the natural elevation of the existing rock surface which would mean, presumably, blasting out rock to create a cliff which at places could be as much as about 290 metres tall. Near the dam, the reservoir bed perimeter wall would be only 40 metres or less tall. The further from the dam, the higher the wall will be and the more rock needs to be excavated. A vertical reservoir bed perimeter wall would be ideal to maximise reservoir volume wherever the geology provides a strong stone which can maintain a vertical wall face without collapse, (a stone such as granite perhaps). Where the geology only provides a weaker stone then a sloping perimeter wall at a suitable angle of repose for reliable stability would be constructed. So the reservoir perimeter wall could be as sloped as shallow as 45 degrees from the natural elevation at the perimeter of the eclipse sloping down to the reservoir bed at 463 metres elevation in the case of the weakest and most prone to collapse kinds of stone. Exactly how strong the stone is at each location I guess we'll only find out absolutely for sure if and when engineers start blasting it and testing the revealed rock wall face for strength. The shape of the perimeter of the excavated reservoir bed is not absolutely critical. So long as it ends up as a stable wall or slope, however it is shaped by the blasting, it will be fine. There is no need to have stone masons chip the perimeter smooth and flat! The ellipse is simply the easiest approximate mathematical shape to describe and to draw. If the end result is not a perfect ellipse, don't worry, it will be fine! OK, well I guess that's the vision part over. The rest is fairly straight-forward engineering I hope. Oh, and there is always getting the permission and the funding to build it of course which is never easy for anything this big. OK, well if anyone has any questions or points to make about my vision or can say why they think the SSE plan is better than mine, or if you don't see why we need any pumped storage hydroelectric scheme at Coire Glas, whatever your point of view, if you have something to add in reply, please do. That is certainly thinking BIG! Nothing skimpy about your scheme. Very interesting. Been to Aberdeen once in 1992 and thrice to Scotland in the 90s. Aberdeen is a lovely place. Congratulations on working out such a big scheme in detail. The Devil, as always, is in the details. My concern is that the net efficiency in such a system cannot be better than about 60 to 70%, considering that you pump up the water first and use it later. Of course, the great advantage is one of load levelling. Have you considered the load levelling that will be needed before finalizing the reservoir size? Why I am asking this is that evaporation and seepage losses from a large reservoir represent irrevocably lost pumping power. Congratulations on working out such a big scheme in detail. My concern is that the net efficiency in such a system cannot be better than about 60 to 70%, considering that you pump up the water first and use it later. Sure. Such systems work to supply power efficiently only when there are times when the wind-power (and other sources of renewable energy) generators are at times not only supplying the complete load from customers but have some power left over which would otherwise go to waste, such as windy nights when people are tucked up in bed and not consuming much in the way of electricity. Considering the plans afoot here to invest in a lot of wind-power generators ..
it seems that we are heading into frequent times of excess wind-power and it is precisely that strategic opportunity for energy storage which I have in mind and I wrote about recently as follows. This is a statement of the obvious as far as Scottish electrical power-generation engineers and scientists are concerned I expect but I am making this statement anyway, not for the benefit of our scientists or engineers but to inform the political debate about the potential of the Scottish economy "after the North Sea oil runs out" because political debate involves mostly non-scientists and non-engineers who need to have such things explained to them. The Scottish economy has a profitable living to make in future in the business of electrical energy import/export from/to English electrical power suppliers and perhaps even to countries further away one day. The tried and tested engineering technology we Scots can use in future to make money is pumped-storage hydroelectricity. In Scotland, the Cruachan Dam pumped-storage hydroelectric power station was first operational in 1966 and was built there to take advantage of Scotland's appropriate geography and available capital. So Scotland has the appropriate geography for pumped-storage hydroelectric power and we have the capital particularly if we invest some of the taxes on North Sea oil before it all runs out and it is all spent. Investment in wind-power energy generation is proceeding apace, in Scotland, in England, on and offshore, and that's very "green" and quite clever, though wind power is not as dependable as tidal power, but unless and until sufficient capacity to store energy becomes available to supply needs when the wind isn't blowing then conventional, and perhaps increasingly expensive, coal, gas or oil burning or nuclear energy power will still be needed to keep the lights on when the wind doesn't blow. Here is the opportunity for the Scottish economy in a future where wind-power generation is increasingly rampant: if we Scots build a large capacity of new pumped-storage hydroelectric power stations, not only can we supply all our own Scottish energy needs from "green" renewable energy schemes, but we could provide energy storage capacity for customers outside Scotland, particularly in England, who live in a land not so well endowed with appropriate geography for hydroelectric power. In future, a Scotland with investment in a massive pumped-storage hydroelectric capacity could buy cheap English wind-power while the wind is blowing then sell the same energy back to English power suppliers, at a profit, when the wind isn't blowing and the English will pay more for energy. So everyone wins, the energy is all green, the electricity supply is always available when it is needed and that is how the Scottish energy economy does very well after the North Sea oil runs out. So problem solved but not job done as yet. We Scots do actually need to get busy investing and building pumped-storage hydroelectric power generation and supply capacity in Scotland now. Of course, the great advantage is one of load levelling. Have you considered the load levelling that will be needed before finalizing the reservoir size? Well load balancing of sudden demand for power (people putting the kettle on for tea / coffee during a break in a popular TV programme) which is difficult for other generators to respond to quickly, is indeed the traditional use of such pumped-storage (such as Cruachan, mentioned above and there is an even bigger pumped-storage hydroelectric scheme in Wales) because it is so quick to respond but we have enough of that kind of "load balancing" already so no, I have not considered that kind of "load levelling" I think you are talking about. Why I am asking this is that evaporation and seepage losses from a large reservoir represent irrevocably lost pumping power. No doubt there will be times when evaporation is a factor, but this is the west coast of Scotland and it rains regularly so I don't think that is too much of a worry. The natural seepage losses will depend on the geology but if there is an issue with the natural seepage then fissures could be sealed, impermeable barriers etc added to the design. Such issues would apply to the SSE planned reservoir for the site and I don't really see it as my job to do the routine engineering work which would apply for any scheme. No I am really presenting a vision for a bigger dam and reservoir than the SSE propose and it is dealing with the issues of a much bigger scheme that interest me most. I don't work for the SSE. I am an independent author concerned with political issues most of the time but I have a background in science so I felt this was something I could contribute a better vision to than the SSE are offering, inspirational though their vision is. Thank you for a detailed response. May the powers that be spare some thought to your vision which is power for all. The Dow-dam would be more than 3 times higher than the proposed SSE-dam. In this diagram, a horizontal line one third of the way up the Dow-dam indicates the relative height of the SSE dam although it is not aligned with this cross-section. Here is an annotated satellite photograph of the land south from Coire Glas showing Loch Lochy, Loch Arkaig, the isthmus between the lochs, Mucomir where Loch Lochy empties into the River Spean before it flows on as the River Lochy, the Caledonian Canal and Fort William where the river flows into a sea loch. Loch Lochy is separated from a neighbouring loch, Loch Arkaig, by a 2 km wide isthmus, which I have identified on this map as "the Achnacarry Bunarkaig isthmus", after the local place names. It ought to be quite straight forward to build a canal or culvert, to connect those two lochs. The idea is that the new waterway would be wide and deep enough, enough of a cross section area under water, perhaps hundreds of square metres, so as to allow free flow from one loch to the other, so as to equalise the surface elevations of the two lochs, so as to increase the effective surface area of Loch Lochy so as to decrease the depth changes to Loch Lochy when water flows in from the Coire Glas reservoir when it discharges water when supplying power. Now, Loch Arkaig has a natural surface elevation of 43 metres and this would be lowered to that of Loch Lochy. The surface area of Loch Arkaig is given by wikipedia as 16 km^2 also, (though it looks to me somewhat smaller than Loch Lochy). In addition, partially draining Loch Arkaig to bring its level down to that of Loch Lochy will also reduce its surface area. Potential depth variation of Loch Lochy + Loch Arkaig = 400 000 000 m^3 / 26 000 000 m^2 = 15.3 metres. Without equalising the loch levels, the depth changes to Loch Lochy that would require to be managed may be potentially more like 25 metres than 15 metres. So the new waterway is an important part of the new water flow control works that Coire Glas/Dow requires to be constructed. When the Coire Glas reservoir is full, then the water level of Loch Lochy should be prevented, by new water works - drains, dams, flood barriers etc. - from rising due to rainfall and natural flow into the loch above a safe level which allows for the reservoir to empty into the loch without overflowing and flooding. The safe "upper-reservoir-full" loch level will likely turn out to be around about 15 metres below the maximum loch level. The next diagram showing the new loch drain and the reservoir pump inlets indicates how this might be achieved. The drain from Loch Lochy to the sea which goes underground from the 14 m elevation level in the loch would need capacity for the usual outflow from Loch Lochy which currently goes through the Mucomir hydroelectric station. I have estimated the flow through Mucomir from its maximum power of 2MegaWatts and its head of 7m as somewhere near 0.2 Mega-cubic-metres-per-hour and compared that value using a spreadsheet I have written to predict the capacity of water flow through different sizes of drains using the empirical Manning formula and this is also useful for determining the appropriate size of the new water channel between the lochs. To construct Coire Glas/Dow/600GW.Hrs/12GW may cost of the order of around £20 billion, but that would be my order of magnitude educated guess more than a professional cost estimate. In other words, I'm only really confident at this early "vision" stage that the cost would be closer to £20 billion than it would be to £2 billion or to £200 billion but I'm not claiming to be able to quote an accurate cost estimate at this stage. I have not itemised my costs - how much for land, how much for labour, how much for trucks, how much for diggers, how much for cement, how much to install the generators etc. and the SSE have not published itemised costs for theirs either so I can't calculate my costs in a proportion to the SSE's costs. Although my version offers 600 GigaWatt-Hours energy and 12 GigaWatts power (or 20 times the capacity and performance) some of the items in my version would cost more than "in proportion", in other words more than 20 times the SSE's cost. For example, the cost of my dam will be more like 27 times the cost of the SSE's dam. (3.44 times higher and thicker and 2.27 times longer). For example, the cost of excavating 400 million tonnes of rock from the reservoir bed to increase the capacity of the reservoir to hold water (and energy) in my version won't be in proportion to the SSE costs for excavating their reservoir bed because, as far as I know, they don't plan to excavate their reservoir bed at all. On the other hand, my land costs are about the same as the SSE's - much less than in proportion. I may well need to use more land to dispose of the additional excavated rock spoil but perhaps when that additional land has been landscaped over it could be resold? So it depends how much the land is as a proportion of the SSE's costs. If land is a small part of their costs, if 20 similar sites to build on are just as cheap and easy to buy then my costs will be much more than proportional, since saving land won't save much money. If land is scarce and valuable and the cost to purchase suitable land with a good chance to get permission to build on it is a significant proportion of the SSE's or anyone's costs to build 20 of their size of hydro dam schemes then my costs may be better than proportional. Sometimes securing suitable land for development can be very problematic, very expensive. Sometimes people won't sell their land. Sometimes the authorities won't agree that the land can be used in this way. The SSE say that suitable sites for such pumped storage schemes are rare indeed, so land costs may be very significant and my scheme good value for money. If indeed the cost of my scheme is somewhere around £20 billion it is likely to cost far more than the SSE or any electrical power supply company looking to their annual profits for the next few years could possibly afford. Something like £20 billion I expect could only be found as a national public infrastructure project, spending government money, like the building of a large bridge or motorway would be. A £20 billion government project would require Treasury approval, at least while Scotland is ruled as part of the UK. I have suggested funding my much larger hydro dam scheme by re-allocating of some of the Bank of England's "Quantitative Easing" funds which amount to some £300 billion of new money printed with not much to show for it. I have been able to extract this information from the British Geological Survey (BGS) Geology of Britain viewer, from the 1:50 000 scale map. According to this map, the bedrock at the site which would be used to build the dam on top of and to extract rock from to create the tunnels for the underground complex seems to be a rock geologists call "psammite" which I understand to mean here "a metamorphic rock whose protolith was a sandstone". What neither the map nor the "psammite" name is telling us is how fractured the psammite rock there is and therefore how strong and also how impermeable or otherwise to water this rock is likely to prove to be, both of which would be interesting for any engineers building a pumped-storage hydro dam scheme there to know. What does look fairly obvious to me is that the superficial deposit of what the map calls "hummocky (moundy) glacial deposits - diamicton, sand and gravel" would not be strong enough, nor impermeable enough to build any dam on top of and at least along the line of the dam, this glacial deposit ought to be removed to get down to the bedrock within which to establish the foundations of the dam, although I would think that this glacial deposit might be made into aggregate to make the concrete for the dam by the sounds of it. The top of the Dow-Dam has an elevation of 780 metres by design. 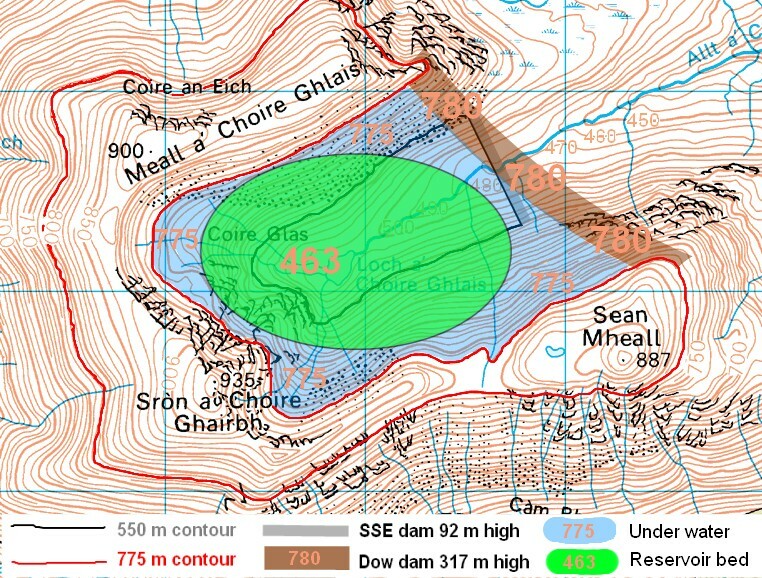 The lowest elevation of the current ground surface of Coire Glas along the line of the proposed dam is 463 metres and subtracting 463 from 780 is how the initial value of 317 metres for the nominal height of the dam above the existing surface used in previous diagrams was arrived at. However, the glacial deposit of as yet unknown thickness is to be removed before building the foundations of the dam within and upon the bedrock. Although the lowest surface elevation along the line of the dam of the bedrock too is unknown a formula relating the Height of the Dam Above the Bedrock (HDAB) to the Glacial Deposit Depth (GDD) can be easily stated. If the GDD turns out to be 13 metres then the dam will be 330 metres tall. If the GDD turns out to be 83 metres then the dam will be 400 metres tall. I propose that the height of the Dow-Dam be as tall above the bedrock as it needs to be to keep the top of the dam at an elevation of 780 metres no matter how deep the removed glacial deposit layer turns out to be. My approach may well differ from the SSE's approach. The SSE have said that their dam will be "92 metres" high and they may stick to that without having any goal for the elevation of the top of their dam. As the diagram indicates, I propose to secure the Dow-Dam to the bedrock by massive piles inserted and secured into shafts which would be drilled into the bedrock. It would be great if you could post some video demonstrations. I found this on YouTube which illustrates the principle of using wind turbines and pumped storage hydro dam schemes together. "Dow" equation for the power and energy output of a wind farm. "The power and energy of a wind farm is proportional to (the square root of the wind farm area) times the rotor diameter". In his book which was mentioned to me on another forum and so I had a look, David MacKay wrote that the power / energy of a wind farm was independent of rotor size which didn't seem right to me considering the trend to increasing wind turbine size. Now I think the commercial wind-turbine manufacturing companies know better and very possibly someone else has derived this equation independently of me and long ago - in which case by all means step in and tell me whose equation this is. Or if you've not see this wind farm power/energy equation before, then see if you can figure out my derivation! No takers for the derivation challenge huh? OK then. Assume various simplifications like all turbine rotors are the same size and height, flat ground and a rotationally symmetrical wind turbine formation so that it doesn't matter what direction the wind is coming from. Consider that an efficient wind farm will have taken a significant proportion of the theoretically usable power (at most the Betz Limit, 59.3%, apparently, but anyway assume a certain percent) of all the wind flowing at rotor height out by the time the wind passes the last turbine. So assume the wind farm is efficient or at least that the power extracted is proportional to the energy of all the wind flowing through the wind farm at rotor height. This defines a horizontal layer of wind which passes through the wind farm of depth the same as the rotor diameter. The width of this layer which flows through the wind farm is simply the width of the wind farm which is proportional to the square root of the wind farm area. Therefore the width or diameter of a rotationally symmetrical wind farm is a critically important factor and arranging the formation of wind turbines to maximise the diameter of the wind farm is important. Consider two different rotationally symmetrical wind turbine formations, I have called the "Ring formation" and the "Compact formation". The circumference of the ring formation is simply n times s.
The diameter of the ring formation is simply n times s divided by PI. The area of the compact formation, for large n, is n times s squared. This is slightly too big an area for small n.
The diameter of the compact formation, for large n, is 2 times s times the square root of n divided by PI. This is slightly too big a diameter for small n.
This is easily corrected for small n greater than 3 by adding a "compact area trim constant" (CATC) (which is a negative value so really it is a subtraction) to the s-multiplier factor. The CATC is 4 divided by PI minus 2 times the square root of 4 divided by PI. This CATC correction was selected to ensure that the compact formation diameter equation for n=4 evaluates to the same value as does the ring formation equation for n = 4, that being the largest n for which the ring and compact formations are indistinguishable. It is of interest to compare the two formations of wind farm for the same n and s.
The diameter of the ring formation is larger by the ratio of diameter formulas in which the spacing s drops out. This ratio can be evaluated for any n > 3 and here are some ratios with the compact value of the ratio normalised to 100% so that the ring value of the ratio will give the ring formation diameter as a percentage of the equivalent compact formation diameter. As we can see that for big wind farms, with more turbines, the ratio of diameters increases. Since the Dow equation for the power and energy of a wind farm is proportional to the diameter of the wind farm then it predicts that the power and energy of the ring formation wind farms will be increased compared to the compact formation wind farms by the same ratio. In other words, the Dow equation predicts, for example, that a 100 turbine wind farm in the ring formation generates 3 times more power and energy than they would in the compact formation, assuming the spacing is the same in each case. My recommendation would be to prefer to deploy wind turbines in a wind farm in the ring formation in preference to the compact formation all other things being equal. The compact formation can be improved up to the performance of a ring formation by increasing the turbine spacing so that the circumference is as big as the ring but then if a greater turbine spacing is permitted then the ring formation may be allowed to get proportionally bigger as well keeping its advantage, assuming more area for a larger wind farm is available. The ring formation may be best if there is a large obstacle which can be encircled by the ring, such as a town or lake where it would not be possible or cost effective to build turbines in the middle of it and so a compact formation with larger spacing may not be possible there. Where it is not possible to install a complete ring formation then a partial ring formation shaped as an arc of a circle would do well also. Kindly Tell me peter how is the spacing between two wind turbines calculated? I mean how is the area per turbine is calculated? I am not so crazy and apolitical as to trust any one of the Queen's ministers of Scotland to help, ever. I have written to them often to get them to help on many political issues but they rarely if ever seem actually to help. I am more of a republican revolutionary political activist who sees the Queen and her ministers as the problem and who wants to get them out of office where they can do less harm to the people. If you would like me to address specifically engineering, rather than political, issues then I would be delighted to do so but I more than sceptical about the Queen's government of Scotland. I am practically in a state of cold war with them, so I can't be expected to be anything other than extremely negative about these politicians even if on occasion they announce a plausible sounding initiative. Here is a video I made describing the Queen's ministers of Scotland as traitors betraying the people of Scotland for their Queen. As to the specifics of the story you link to "Fund set to drive growth of renewable energy in Scotland" I would note that the amount is £103 million. The GDP of Scotland is about £131 billion or 1270 times more than that fund. So that fund is to be about 0.08% of Scottish economic activity in one year. It is a relatively small amount and I cannot vouch for how the money will be spent - unusually well or the usual incompetence. The SSE's hydro dam 30GW.Hrs scheme for Coire Glas is estimated to cost £800 million over a number of years though they have given no start date for construction. My hydro dam 600GW.Hrs scheme for Coire Glas has not been costed but may cost of the order of £20 billion perhaps which if spent over 3 years would be 5% of Scottish GDP per year. So you can see that I am talking about a national project, which would involve spending a lot of money and employing a lot of people. It would perhaps be as significant for Scotland as the man-on-the-moon mission was for the USA. I am describing a very significant project and the politician in this story is talking about a token initiative to look as if he is doing something. The only thing any politician could really do to help would be to try to ban the Queen from Scotland and to provoke a republican revolution so that eventually after the kingdom has been overthrown we can establish a republic and then we can get a good president and a good government of Scotland. But these politicians are the Queen's men in charge of Scotland so they won't try to ban the Queen. They will rule Scotland for her advantage and their own. I am sorry if that is a more political answer than you were looking for. All that followed after that about "Wind farm turbine formations" did introduce a few other equations for my example formations but as my example formations were two fairly arbitrary formations out of an infinite variety of possible formations they hardly seem worthy of being described as "derived" equations of general application. The number of turbines and their spacing will effect the efficiency of the wind farm in extracting energy from the wind flowing through it therefore power and energy of a wind farm cannot be entirely independent of the number of turbines and the turbine spacing. The formation equations do use the "s" for spacing but s is a variable. The spacing isn't something that any of my equations tell you how to calculate from other factors. The "s" variable which represents the turbine spacing is a starting point for working out other factors, such as the circumference of the ring formation or the circumference of the compact formation. In the case of the compact formation, I have simply arranged the turbines on the corners of a square grid with some rows of turbines also shifted along to fit into a circular wind farm shape. Anyway for that arrangement the area per turbine is approximately the spacing squared, though that approximation is only at all accurate for a large number of turbines when calculating a circumference of my compact formation. The square grid is not the only way to arrange turbines closely together. For example, a triangular grid arrangement is possible and there the area per turbine would be a little less than the spacing squared I think. There is nothing special about the compact formation so there is nothing special about the area per turbine being the spacing squared. That just happens to be the example formation I selected out of an infinite variety of formations. Please don't think I am recommending the compact formation. Don't think I am recommending packing turbines closely together. Don't think I am recommending an area per turbine of the spacing squared. I am recommending none of those. I think it is clear that I prefer the ring formation out of my two examples and there I have not even defined an "area per turbine" because I did not need an "area per turbine" expression to work out the circumference of the ring which is all I needed to work out to compare the relative power and energy performance of the two example formations. Politics are always murky and I keep off. That was a hard hitting video. Well made. Hopefully wisdom may dawn on the powers that be. Well yes those were examples, as there are infinite number of formations possible. And we had assumed many simplifications like height and flat ground and all. What i want to know is there a similar example which tell us the relationship between "s" and rotor diameter or a simple factor like "s" is "x" times rotor diameter. Yes i understood you are recommending ring formation. But won't that take a large area? Ring formation can very well be used to surround a city but if we want to put a wind farm on patch of land we will most probably go for compact formation because we have a limited area and more turbines can be installed. The mathematical relationship mentioned above is only for comparison between two formation if the number of turbines is same and we have a relatively large area available to us. But these days Area is the limiting factor isn't it?? For a mathematical analysis, assuming flat ground makes it simpler but in practice hilly ground can simplify the decision of where to site the turbines. Onshore turbine installations in hilly or mountainous regions tend to be on ridgelines generally three kilometers or more inland from the nearest shoreline. This is done to exploit the topographic acceleration as the wind accelerates over a ridge. The additional wind speeds gained in this way can increase energy produced because more wind goes through the turbines. It is really for wind farms which are intended to be installed on flat ground or at sea where the mathematical analysis is most useful for advising on a better formation to increase power and energy performance. This is not to say that flat ground is always better but if you must use flat ground or sea then you had better have a reasonably good mathematical analysis to inform your choice of formation. Sadly I note that many existing wind farms on flat ground and at sea have been built in formations which happen to be rather closer to my "compact formation" than my "ring formation" and as a result of their poor formation design such wind farms will not be performing as well as they should be. To my mind, a larger spacing avoids or minimises the degree of neighbouring wind turbines sheltering each other from the wind. So larger spacing is better all other things being equal. As for what is common practice as regards spacing turbines in the wind farm business you can consult google or wikipedia for the state of any art. On most horizontal windturbine farms, a spacing of about 6-10 times the rotor diameter is often upheld. However, for large wind farms distances of about 15 rotor diameters should be more economically optimal, taking into account typical wind turbine and land costs. This conclusion has been reached by research conducted by Charles Meneveau of the Johns Hopkins University and Johan Meyers of Leuven University in Belgium, based on computer simulations that take into account the detailed interactions among wind turbines (wakes) as well as with the entire turbulent atmospheric boundary layer. Moreover, recent research by John Dabiri of Caltech suggests that vertical wind turbines may be placed much more closely together so long as an alternating pattern of rotation is created allowing blades of neighboring turbines to move in the same direction as they approach one another. By the way, I suspect that the common Horizontal Axis Wind Turbines too could be placed closer together in a ring formation if alternate wind turbines rotated in opposite directions because again the blades of neighbouring turbines would move in the same direction as they approach each other, minimising turbulence which wastes energy. Precisely and that's why it is better, performance wise. My equation states that the power and energy of a wind farm is proportional to the square root of the area, so a wind farm occupying an area 4 times as big as another wind farm, gives twice as much power, all other factors being equal. My equation advises that if you cannot use more area then use a larger turbine rotor, because that is the other sure way to increase power and energy performance. I am not sure why anyone would want to designate a patch of land for a wind farm. Possibly because the word "farm" says to people, it should be like a farm with a field of wind turbines, like a field of cotton or a field of grazing cattle? However, other parts of the electricity supply business are not on patches of land. The transmission system is linear, pylons go from A to B, they do not occupy patches of land. Perhaps if wind "farms" were called something else, it might help people to understand how to organise them? Perhaps phrases like "wind way" or "wind path" or "wind belt" or "wind route" or "wind curve" or "wind arc" or maybe you can think of better names which explain that really you need to take up more area or a different shape of area than just a "patch" of land. We do need to explain that using a patch of land and cramming lots of turbines into it with small spacings is inefficient (of expensive wind turbines) and I think the phrase "wind farm" may be giving people the wrong impression. No I don't think area is the limiting factor. I can't see a wind turbine when I go about my daily business and I suppose most people are the same. I saw one wind farm on one location when I went on a bus trip. 99% of the journey I saw no wind turbines. So most land is empty of wind turbines. Certainly most sea is empty of wind turbines. So I think the inefficient idea of compacting wind turbines together in small patches of land or sea is what is limiting the performance of wind generators. I think poor formation and small spacing is what is limiting the growth of wind turbines because if the turbines were formed up better and spaced out a lot more they would perform much better. Thank you Peter you have been most informative..
About the Coire Glas Project, at 317 meter height it would become the highest dam and would create a very large reservoir. What is your take on Induced Seismicity ? Thank you Peter you have been most informative. Thanks for pointing that out. I had considered the danger from earthquakes to the dam but not the inducing of earthquakes by the water in the reservoir itself. Well I have had a quick review of the evidence and yes it looks like a serious problem for deep reservoirs. Unfortunately, understanding of reservoir induced seismic activity is very limited. However, it has been noted that seismicity appears to occur on dams with heights larger than 100 meters. My first take is that one idea is to try to stop the penetration of water under high pressure into fractures in the bedrock, stop this high pressure water from widening and extending bedrock fractures and to do that one idea would be to build in a large flat drain to cover the whole reservoir bed. I have drawn a diagram comparing no drain on the left, with a reservoir bed drain on the right. So the idea is that the top layer of the bed drain is as impermeable as practical, perhaps reinforced asphalt concrete or maybe clay is a cheaper solution? Then working downwards, the permeable layers are increasingly bigger particles, sand at the 2nd top then going down to grit, gravel, small stones and finally large stones. The higher layers support the top impermeable layer which is under high pressure from the reservoir water and the lower layers provide many small channels for any (hopefully tiny amounts of) water which forces its way through the supposedly impermeable top layer to drain down the slope of the reservoir bed to the base of the dam and then out under the dam through drain-pipes built into the base of the dam. The bottom layer is another impermeable layer to try to make doubly sure that the low pressure water that gets into the bed drain will find its way out through the dam drain pipes by following the course of the drain. These kinds of layers are used to make simple narrow drains I think but I don't know if ever anyone has covered the entire reservoir bed with one large flat drain? Any feedback would be welcome because this is the first time I have suggested this. In 1958, I visited the Caltex refinery in Vizag, India, as part of the curriculum. They were making a shallow reservoir (about two acres) for process water. After the exposed surface was compacted by the usual road roller kind of equipment a giant sprayer sprayed a quarter inch thick rubberised asphalt fine sand mixture. We were told that rubberising made the coat flexible and resistant to cracking and generated an impervious surface. I do not know if this was standard practice in Caltex or specifically developed for the location. The entire activity was cotrolled by the US contractor. I too believe that the reservoir that large can trigger a small earthquake, but we will have to do additional work on reservoir floor and make it impermeable. Geology of the whole area needs to be more thoroughly researched. These factors would make it more expensive. My second take is to use drain-pipes through the base of the dam which now extends all the way down to the bed rock with the drain-pipes built in, instead of continuing the bed drain under the dam as I had at first. I think this is a better solution because the pressure under the dam would be greater than under the water and a stronger design is possible under the dam because there is no need for any permeability from the dam into the drain pipes. I have removed my first take diagram from my earlier post and replaced it with the second take diagram. I was not even born in 1958 and I am now old enough to be a grandfather (although sadly I am not even a father  ). It sounds like a similar asphalt mixture was used here. It consists of a reservoir 110 ft (34 m) deep, ... Because impervious bedrock is more than 800 feet (240 m) below the reservoir, the builders had to line the reservoir with a layer of asphalt and clay to prevent water seeping into the ground. I am wondering though if this material would stand up to repeated severe compression /decompression cycles as the depth in my reservoir would change from 317 metres to empty? I wonder if perhaps a more exotic silcone binder for say a silcone/clay mixture would be stronger and take the huge pressure changes better? Perhaps a word on why I think the additional complexity and expense of a bed drain (and drains for the sides too) is better than simply adding an impermeable layer. Consider the fault condition of the two possible solutions. If a simple impermeable layer fails, if it cracks or ruptures or disintegrates under the pressure changes, how would anyone know? It may look fine but be leaking high pressure water into the bedrock and inducing seismicity which OK the engineers would notice any earthquakes but so would everyone else, the earthquakes could cause damage or loss of life and it could lead to a loss of confidence in the project and in the engineers who built it. They could go to jail! If the top impermeable layer of the bed drain fails then there would be some water pouring out of the drainpipes through the base of the dam when at most it should only be a tiny trickle of water. So the engineers would know there was a problem with the bed drain and they'd know to drain the reservoir and fix or replace the top supposedly "impermeable" layer, fix the bed drain so that it operated as it should. So failure with the bed drain is noticed right away and it is not a catastrophic failure. Whereas failure with the simple impermeable layer may not be noticed until a catastrophic earthquake happens. So this is why I think the bed drain is worth the extra complexity and expense. It is a more fault tolerant engineering solution.